Home > Coffee/Tea > Caro Extra Coffee Substitute. 150gm. 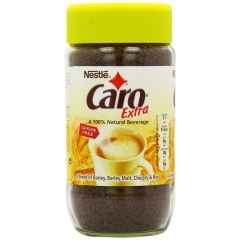 Caro is a brand of caffeine-free roasted grain beverages. It is generally considered a coffee substitute. It is manufactured by Nestlé and was first introduced in West Germany in 1954. It is available throughout Europe as well as other markets including New Zealand and Australia. It is imported to the United Statesunder the name Pero. The name "Caro" sounds like the French word "Carreau", which translates to "diamonds" in playing cards, as seen in the Caro logo (which is also used on Pero). Nestle Caro Instant Beverage is 100% caffeine free. It is a natural alternative to coffee, blended from the finest roasted and ground barley, malted barley, chicory and rye. 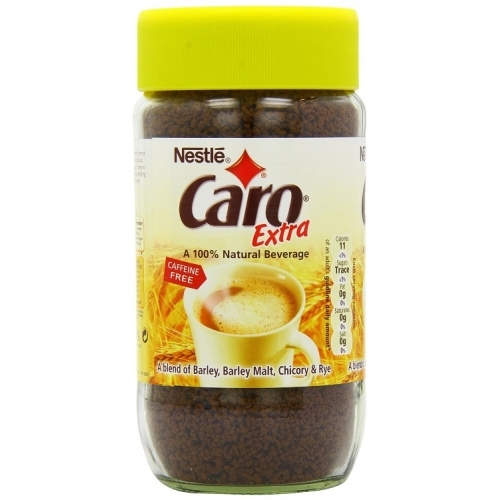 Caro Extra is in granules with a stronger taste than the Instant.